Right Angle 8-Pin Lightning Cable for iPhone 6s / iPhone 6s Plus / iPad Air / iPad Mini / iPad Pro : allputer.com - Accessories for all your Portable Electronics & Computers! You can use this sync cable to connect your device with your Windows PC or Mac allowing you to easily transfer your favorite pictures or music to and from your computer in a more ergonomic way. The 8pin lighting side is an 90 degree connector to make your charging, data-sync easier and less hassale. 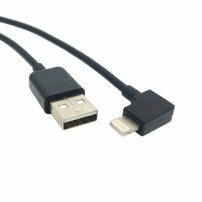 This cable has a durable jacket that protects wire cores and resists kinks and tangles. - Length: 1 meter (or 3 feet) approx.